Amber colored Teardrop String Art earrings or pendant, with gold, orange, green, brown, on silver color wire, silver-colored dangles. These flashy,Teardrop String Art earrings make a great statement. You will get lots of compliments wearing these as earrings or as a pendant, with a variety of outfits. Belly dancers love these! You could remove the earwire and place the earring on a chain or leather necklace to wear as a pendant! This artistic jewelry is approx. 4.25 in. 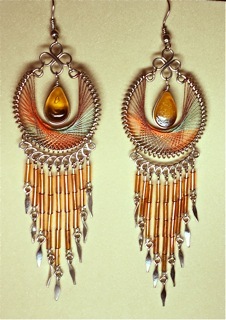 long, orange, green, brown, on silver color wire, with gold beads and silver-colored dangles. There is an amber colored teardrop bead displayed in center. Colors have important meanings in chakras. You save a lot of money and time by purchasing these colorful earrings and not trying to make a pair.